I received this email earlier today. We are consulting with you on behalf of President Hosni Mubarak who just stepped down few days ago as Egyptian Leader. President Hosni Mubarak is in daring need of a sincere partner in a lucrative investment window. (US$98,000,000.00). This fund is part of his personal fund since his 30 years reign as Egyptian leader. The need for an urgent relocation of this fund from Egypt is necessitated by his sudden pressured hand over power to the Egyptian Military which is not a democratic institution. The fears that his assets may be frozen is sheering him in the face and hence for his decision to urgently move this fund. It is in view of this therefore that I write to solicit your assistance and participation to move this fund abroad. All necessary arrangements have been put in place for a successful transporting of this fund abroad. You will be well briefed if you confirm your willingness and interest in this project. We are willing and ready to negotiate your percentage accruable to you in regards to your participation in the successful relocation and investment of this fund. You will be properly briefed on my receipt of your reply confirming your interest to participate and what will be required of you as concerns the successful execution of this project will also be communicated to you. I wait your immediate response to this proposal. It doesn’t surprise me that you’ve chosen me. As a nationally syndicated cartoonist, I get a lot of requests to handle fund transfers from your great continent. First, let me just say how sorry I am to hear what’s happened to Hosni. When I heard of how he was treated, I sent him an FTD “Get Well Soon” bouquet. Of course, I know he’s been deposed and is not ill, but that’s the best I could do with FTD’s limited selection. And believe me, I know what you’re talking about when you speak of the Egyptian military pressuring you. Whenever I go to the Starbucks here in Santa Rosa after 12 p.m., they tell me they don’t brew decaf, and pressure me to either choose a caffeinated drink or a decaf Americano. Let me also say that I share your frustration with having $98,000,000 frozen in various accounts by the banking establishment. I, for one, am always forced to pay a $4.00 fee whenever I use a non-Wells Fargo ATM. Speaking of money, I suppose we should get the awkward matter of my payment out of the way. That said, I will handle this entire transaction for $95,000,000. Now I realize that $95,000,000 represents 97% percent of the money. But consider this. 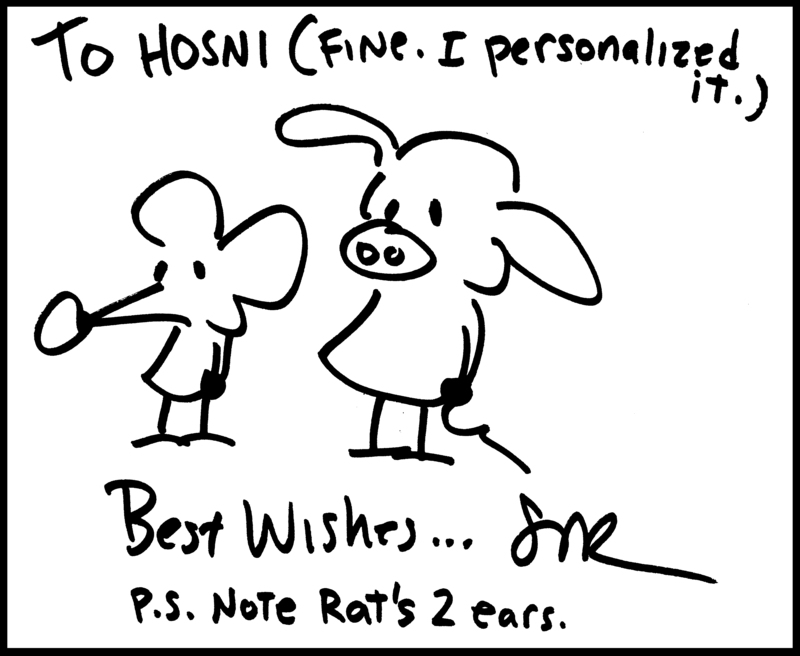 For that amount, I will not only handle this transaction, but I will also send Hosni one (1) signed Rat and Pig sketch. I can’t personalize it (my time’s limited), but I will try to remember to draw Rat with both of his ears. If that’s not enough, I will also agree to friend Hosni on Facebook. With ONE CONDITION: That Hosni does not abuse the privilege by sending me too many of those chat IMs. I can’t even log on to Facebook without dozens of pre-teen girls telling me “Hi!!! !” following by smiling emoticons, and I don’t need that from a former Egyptian president. That aside, I’m certain this can all be worked out. Give my best to everyone at Afritrade International. May their difficulties with the American banking system soon be over. Seeing your daughter’s 4th grade music recital is not quite like watching an Andrew Lloyd Webber play on Broadway. For one thing, it’s in a school gymnasium. With a very small stage. So small, in fact, that it couldn’t fit the kids that were performing. So instead, they all sat in chairs on the gym floor in front of the stage. Making matters worse, there weren’t enough seats for the parents who wanted to attend. Which meant that I had to stand in the far back of the room. 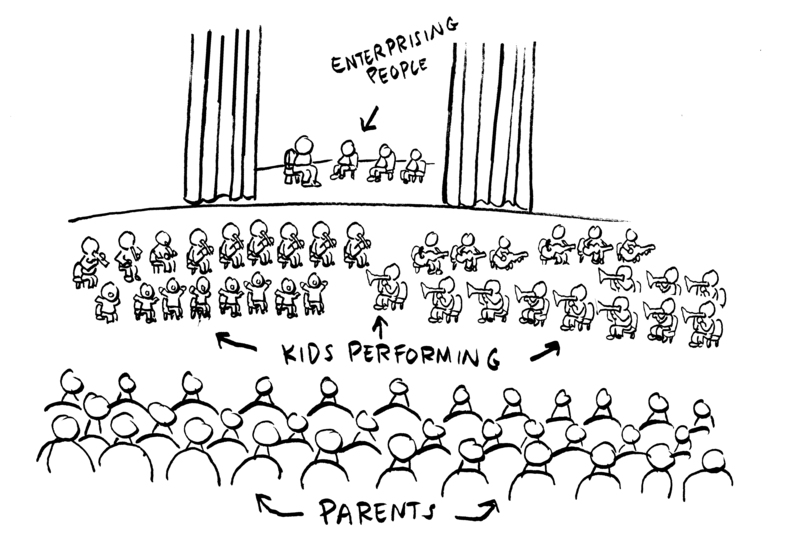 That’s when a few enterprising parents noticed there were some empty chairs up on the stage itself. So they sat there. It created an odd effect, because that is how a play or opera would be staged. The performers on the stage, the orchestra down below. Only these “performers” were just sitting there. Still, you couldn’t help stare at them because they were on stage. And that is when my favorite moment occurred. The most prominent guy on the stage started doing this. 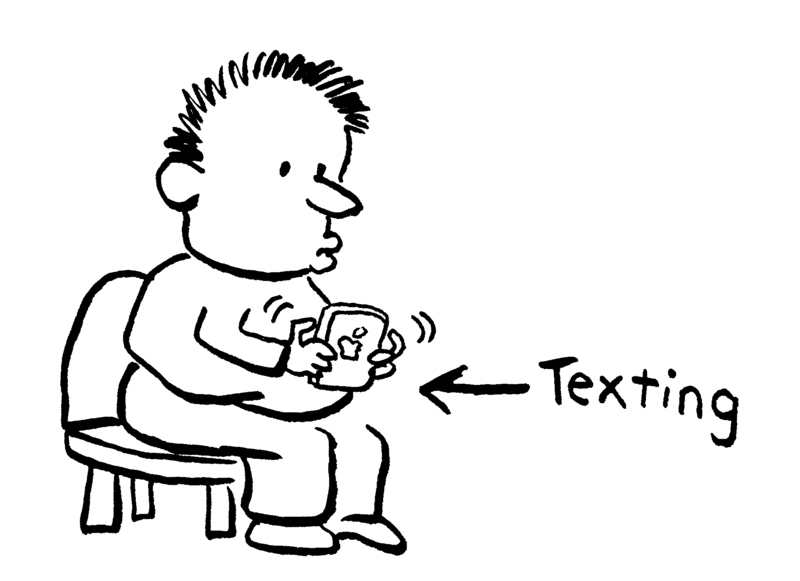 And the best part of all was that sometimes he texted while holding the smartphone down at his side. As though he was hiding it. As though he wasn’t on stage in front of 600 people. Beat that, Andrew Lloyd Webber. 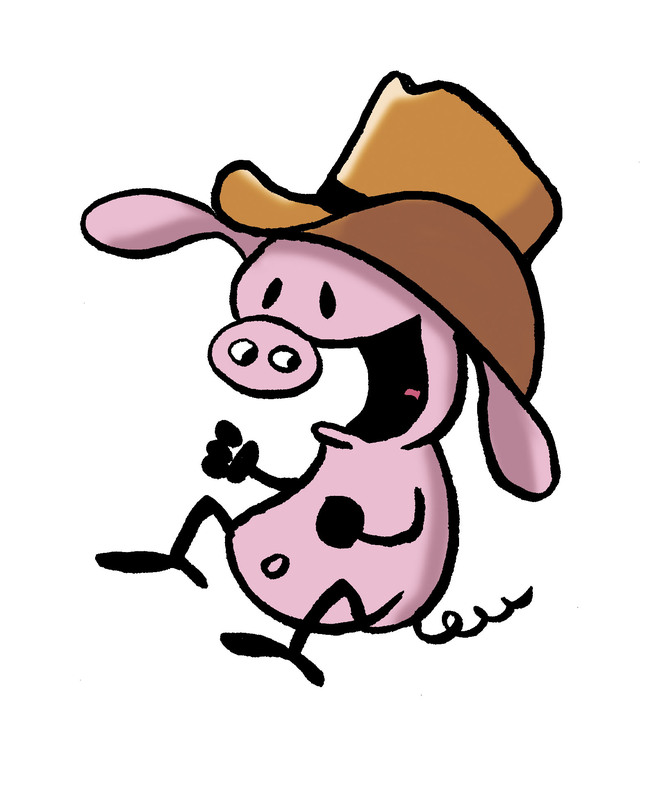 Hello, Texas!….I will be doing my first-ever book signing in Texas on Tuesday, April 5, at 7:00 pm at A Real Bookstore, located at 113 Prairie Road in Fairview. So if you’re in the Dallas/Ft. Worth area (or heck, wherever you may be), stop by and say hi. Unfortunately, it elicited an angry email, which you’ll see below. Now normally when I get angry emails, I ignore them. But sometimes due to the sensitive nature of the complaint, I have to take it a little more seriously and give it a more thoughtful reply. Why do the various vermin who infest and infect the various media venues find it necessary to continually insult not only Italian-Americans, but also Italian culture as well? Why dont you miserable, cowardly bigots pick on some other group for a change? What group would you suggest?